hummingbirds to nest in your yard! Female hummingbirds like to make their nests soft and springy inside. Tough, resilient, and comfortable for the baby hummingbirds after the eggs hatch. 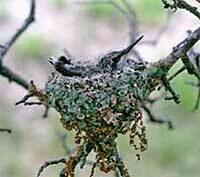 A mother hummingbird often lines her nest with the down from plants and silk from spider webs. She is likely to build her nest near a good source of cushiony material. And that's where Hummer Helper comes in. It's a soft, natural, environmentally friendly nesting material that hummingbirds love to use. It's fluffy and springy, like the moss, lichen, and spiderwebs that hummingbirds often use. It comes in an easy-to-get-at dispenser that lets the fluff dry out quickly after rain. The dispenser's red color will catch the hummingbirds' eye. 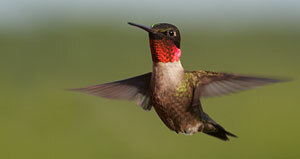 And you can offer in it your yard — even right next to your window — where you can watch the hummingbirds come get it. Goldfinches, titmice, and other birds also use it. The Hummer Helper & Nest Material comes already filled with nesting material. This material has been tested over a number of years before being brought to market in 2008. It is extremely attractive to hummingbirds. People who tested it found that it resulted in hummingbirds nesting closer to their houses, because it makes it easy for the bird to obtain the material she needs for building her nest. It can be hung from any hook, or bracket. We like to bring our hummingbirds right up close. Hummingbirds are almost fearless and will come take the material even with you standing just on the other side of the glass. The dispenser is easy to restock with the Hummer Helper Refills. Enjoy your hummingbirds this summer! Text copyright 2008-2016 by Diane Porter. Photos above courtesy of Songbird Station. The red color of the Hummer Helper wire cage attracts the attention of hummingbirds. The soft cushiony Hummer Helper Nesting Material inside is irresistable to a mother hummingbird who needs to line her nest. Hang it from any hanger or hook outside. Help your birds make their nests soft and cozy with natural alpaca fleece. Hang the ball from the limb of a tree, and watch the birds visit again and again to steal bits of the fluffy wool for their nests. 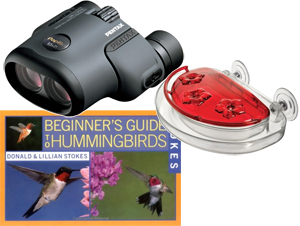 Please call us toll free 800-779-7256 for advice on choosing bird feeders, birdbaths, binoculars, scopes, or other birding products.